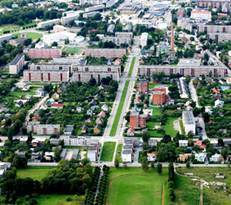 The City of Rakvere (Estonia) is elaborating comprehensive solutions to combine the upgrading of neighbourhoods energy efficiency. How can we save energy? This is the question that today’s cities are searching answers to, even small cities like Rakvere in Estonia. In addition to the largely practiced energy saving measures, like improving insulation of the buildings and promoting public transportation, also means that help oppose urban sprawl, resulting in energy consumption increase, are also very important. To save energy and work against urban sprawl we have to enhance the competitiveness of urban space by creating attractive open spaces that meet the needs and expectations of the residents. Rakvere is a small town with only 17 000 residents, but faces similar challenges as do many other cities. Residents prefer to leave the apartment buildings in the city centre for a detached house in the outskirts. This brings along many environmental issues, but more importantly, increases energy consumption, e.g. for heating and transportation. After analyzing the urban space of Rakvere, we found that Seminari Street is the most densely populated area in the city. Most of the typical apartment buildings, which are the legacy of the soviet regime, are located along the Seminari Street, causing the high density. The energy consumption and appearance of the apartment buildings do not meet the present-day requirements or expectations, and therefore increasingly more attention is paid to the reconstruction of their facades. These buildings are an important part of the urban space and therefore it is in the public interest that these buildings and their surroundings become attractive and enjoyable. By paying attention to the appearance of this residential area and the residents’ needs, the competitiveness of the city should increase and help oppose the urban sprawl. In addition to the energy savings of the insulated buildings, it would help the whole area to be more energy efficient. Although Seminari Street area is the most densely populated in the city, it is hardly adequately utilised. The four-lane street was planned as an avenue in the 1920-s, times of active growth of the city, and is oversized compared to the actual needs - there is not much vehicle traffic. However, there is much pedestrian traffic to witness. It would be reasonable to change the proportions of vehicle and pedestrian traffic areas. The quality of the residential space would increase significantly by bringing the hardly utilised urban space into active usage. We plan to announce an ideas competition to get integrated design ideas for reconstruction of the apartment buildings and transforming the Seminari Street into a linear park, which would also link the heart of the city to the greenery areas in the outskirts of the city. As an outcome of the competition, the city will have design ideas, based on which construction drawings would be drafted and the linear park be built. In co-operation with the co-operative housing associations, by providing them with the construction drawings, it would be possible to reconstruct the apartment buildings and make them energy efficient and attractive. This integrated approach helps to save energy and create an environment that can tackle the challenges of today’s cities with more success.